So you’ve no doubt heard the hype of the Tiny House movement, but what makes these teeny weeny homes so enticing to the everyday Aussie? Self-sufficiency. Produce your own electricity and heating, compost your waste and even consider alternative waste water systems to cut costs significantly whilst being a friend to the environment. Low carbon footprint. Global warming is fast becoming the biggest concern for humankind. The average Australian household produces 18 TONNES of carbon per year. Tiny Homes stand up to the challenge and represent a viable alternative. Eco-friendly. There is no doubt that Tiny Homes are very eco-friendly. They use off-grid systems (i.e. a composting toilet, soakage pits for wastewater, and a solar panel system for electricity, as some examples) and can be relocated to a different location with little trouble. Due to their mobile nature, they also have a small impact on the environment around them. Debt-free. I know what you’re thinking… isn’t the concept of being debt-free just an urban myth made up by daydreamers wishing for a better future? Imagine life if you spent under $100,000 for a house. What would that mean for you? You could be debt-free and not have to work so hard for so little. A tiny home can give you more freedom to do the things you have always wanted to do. Flexibility. Have you ever considered that it is possible to take your house with you? That you could build your house first, before buying land? What if you could purchase more time for yourself, and work less? Hoard no more. Take a second just to think about all the stuff in your house right now. How much of it do you actually need? Some of it is probably holding you back, cluttering your home and your mind. Who should be considering this Tiny trend? This low-cost, low-hassle lifestyle is perfect for first homebuyers, DIY builders, short-term accommodation investors, downsizers, retirees, travellers, friends of the environment and the list goes on; pretty much anyone after the above benefits. That’s just a fact. Perhaps you have a large family, or simply love your large spaces and are willing to invest money into that. Research, ask around and seek expert advice. Get your pros and cons list together and make an informed decision – but who knows, it could be the best thing you ever do. Plan everything from the beginning. Please don’t wing it. The better the plan, the better the result. Figure out what you need, what you want and what you can live without. Ask yourself: what is your end goal? Why have you decided to go Tiny? Then comes the fun part – planning the tiny home itself, from smart floor plan design to getting creative with decorative finishes. As you’ll have a small space, everything matters and each component influences and impacts another. Tiny homes need to be customised more intimately than a standard house, by planning and working out every detail right down to the timber framing, from layout to where the plumbing will be or the type of oven. It can become complicated to change these things later and can also impact transport certification capacity. 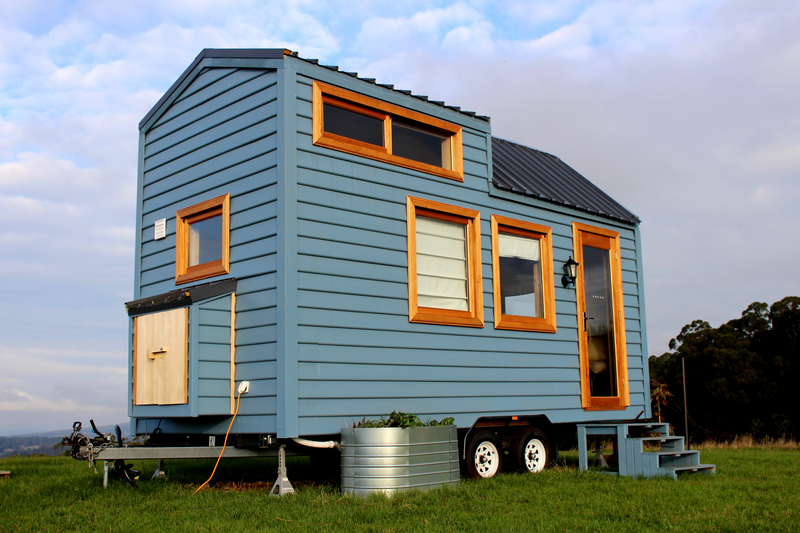 Tiny Homes are an example of responsible, energy efficient and sustainable housing. Because of their size, they fall short of having to comply with building regulations, however the dimensions of Tiny Homes are dictated by the trailer and transport regulations. These are important aspects, which can influence whether or not a Tiny House is a legal or illegal structure once it is completed (DIY builders take note). Thinking of going DIY? One factor that is not always considered is the expenditure on tools, machinery and sundry inventory. Preparation and research is also required to properly understand all obligatory licensing requirements. Is DIY really the best option? You may want to consider building with a Tiny Home company for on-going support, guidance and design – even those who want to do a portion of it themselves. Going it alone means having to outsource parts and find contractors for so many aspects of the build – electricity, water, insurance, regulations, design, construction and more. A Tiny Home company will have an extensive network of trusted professionals and specialists at their fingertips. You’ll also be minimising, if not eliminating, the risk of financial loss commonly associated with self-builds-gone-wrong. Another benefit includes assistance with financing the build and having the Tiny Home fully insured by CIL insurance – Australia’s largest and most established recreational vehicles insurance specialist. Whether you’re looking for something temporary or a permanent lifestyle change up, a Tiny Home is definitely worth considering.